Home > Sheep > Wool market striding forward. 25 Apr Wool market striding forward. 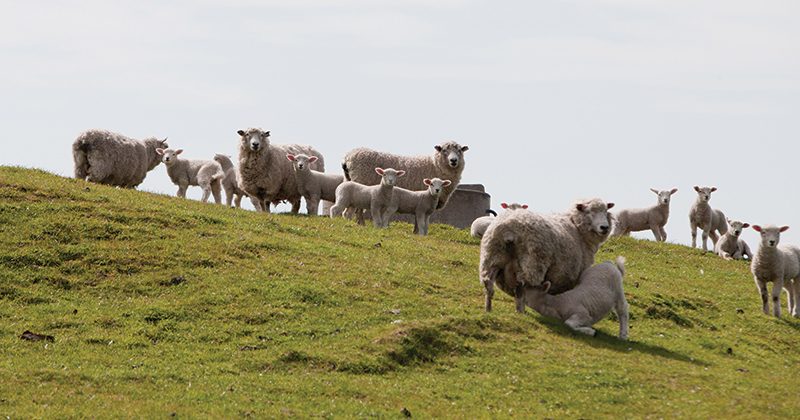 This week according to AWEX the wool market was “striding forward without retreat’. Despite the obvious military connotations, it’s not a bad description. Not only were buyers bidding higher for the “better spec’s” wool types, the strong demand was observed across the board. After last week clearing more than 50k bales, this week only 38,275 bales were cleared to the trade from a total offering of 39,605 bales, resulting in a pass-in rate of just 3.4%. To compare, the average weekly pass-in rate this season is 6.1%. 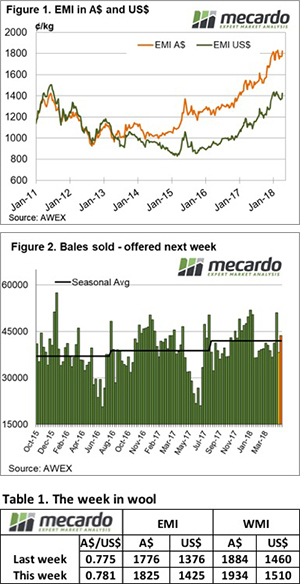 The issue of the variability in weekly offerings is a factor on the market, with a variation of over 10,000 bales in the past two weeks. There is an argument that some effort in managing sale offerings to avoid these large discrepancies is warranted, mainly to assist exporters in managing orders; the question though is who should be responsible. Perhaps it’s an issue for the National Council of Wool Selling Brokers to develop guidelines and policy? The impact of the reduced supply on the market was significant, with the Eastern Market Indicator (EMI) lifting by 29 cents on the first selling day and a further 20 cents on Thursday to see it close for the week at 1825 cents, while in US$ terms the EMI found an additional 49 cents to settle at 1425 cents (Figure 1). This places the EMI just 8 cents shy of the previous recent record level set in February. The AU$ rallied 0.5 cents over the week to US$0.78, while the Western Market Indicator (WMI) gained 50-cents to 1934 cents. As the season progresses, the amount of low yielding wool increases, AWEX reporting that more than half this week’s offering was measured at less than 65% yield. This places increased pressure on buyers sourcing the better style and higher yielding types. Crossbred types joined the rally, posting better levels daily to finish the week strongly. As an indicator, the 28 MPG in Melbourne added 38 cents for the week. A standout quote was the 25 MPG in Melbourne that was quoted up a staggering 130 cents, almost 10% gained for the week. Stronger microns didn’t miss out with the 30 MPG adding a massive 50 cents for the week. Merino skirtings posted improved levels each day and closed the week on a very solid note. Merino Cardings had another good week. The stand out was in Fremantle where the Cardings indicator recorded a huge 72 cent lift for the week. Next week, just under 44,000 bales are offered which is a slight increase on this week’s sales. The following weeks are currently rostered to offer less than 40,000 bales per week. The large clearance in the first week after Easter provided an insight into the current demand, and this week the buyers surprised with the margin of the price rally. It seems a fair bet that next week the February EMI high point will be broached.